This is one of those dresses that looks good on the rack but looks even better on!! The colors are so bright and fun so it calls for minimal accessorizing and lots of strutting your stuff! 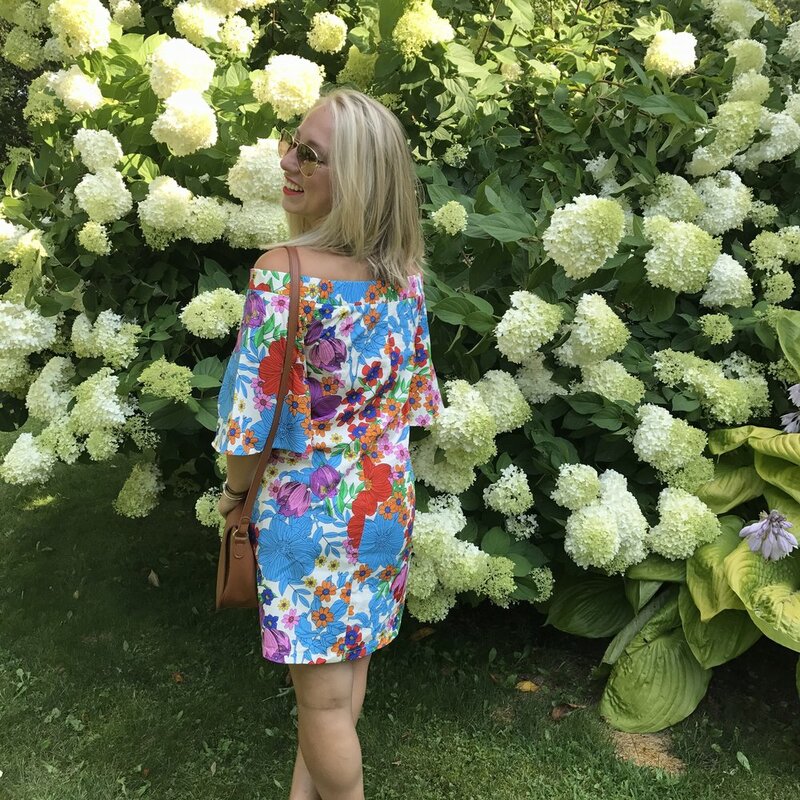 This dress was an in store purchase, so above I have linked the matching shirt which I was able to find online, but it seems like this dress might call for a trip to your closest H&M store front. I could not resist those three quarter bell sleeves though everything about this dress was screaming my name. How bout you, can you resist it? I suspect not!! For sizing reference I am wearing a size 2, this style does run a little big. I have been living in Target lately, which is where I found the perfect wedges. 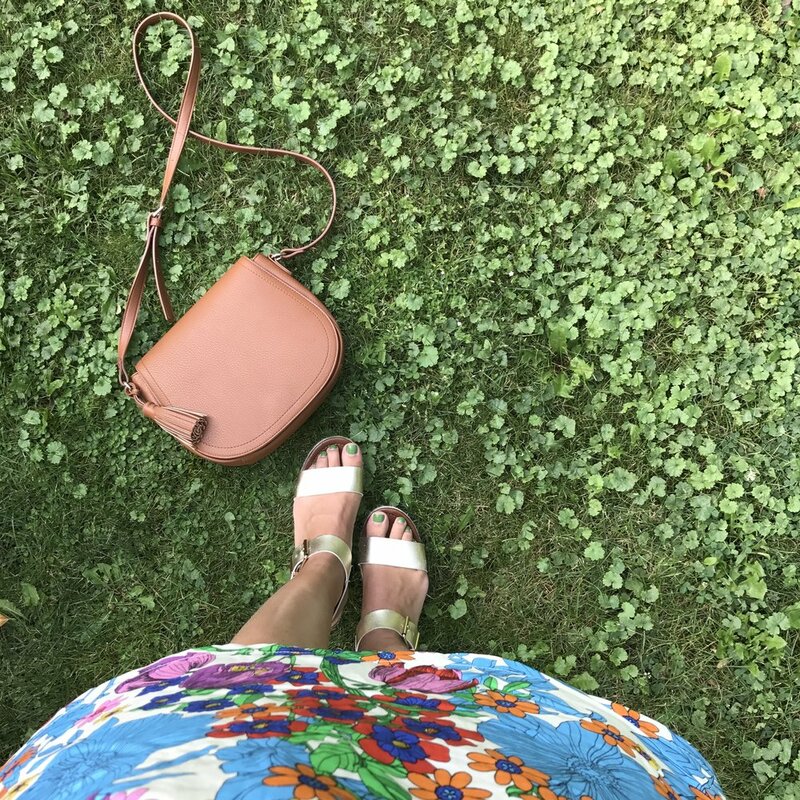 They are beyond comfortable, since they are flat and have no incline you do not get all the beautiful pain of a heel or classic wedge, and you can waltz around in them all day long. Careful though because they are a little prone to ankle twisting every now and then, and I will not be held responsible for any broken ankles, since I am a lover of these lovely wedges! Lets talk about that lipstick though!! I finally found a lipstick that gets the job done! Stila for the win. First of all I've never been a matte lipstick type of girl, but I'm never looking back now. I'm wearing Stila's stay all day liquid lipstick in Venezia, and the title doesn't lie, it stays all day! I didn't have to reapply once. There are tons of pretty colors to choose from too, which is just the cherry on top because I love a good lipstick selection, I mean who doesn't? I wore this look to a wedding anniversary, but It works for a day on the town too. A summer friendly look for multiple occasions. That's the trick, dressy enough but not too dressy, casual enough but not too casual. Check and check!